“Opposition to abortion and euthanasia does not excuse indifference to those who suffer from poverty, violence and injustice. Any politics of human life must work to resist the violence of war and the scandal of capital punishment. Any politics of human dignity must seriously address issues of racism, poverty, hunger, employment, education, housing, and health care. Therefore, Catholics should eagerly involve themselves as advocates for the weak and marginalized in all these areas. Catholic public officials are obliged to address each of these issues as they seek to build consistent policies which promote respect for the human person at all stages of life. This is why the right to life is not merely one among many urgent issues, but rather the foundational one. It provides the cornerstone for a whole architecture of human dignity. Nothing has changed in recent months or years in Catholic thinking about the sanctity of human life. Nor can it. As America’s bishops have stressed so many times, we have an obligation to work for human dignity at every stage and in every circumstance of human life. Here in Philadelphia, our Catholic social ministries model that dedication to the poor and disadvantaged in an extraordinary way. But when we revoke legal protection for unborn children – when we accept the intimate violence abortion inflicts both on women and their unborn children; when we license and sacralize abortion as part of what Pope Francis calls a “throw away culture” — we violate the first and most important human right, the right to life itself. And once we do that, and then create a system of alibis to justify it, we begin to put every other human and civil right at risk. October is national Respect Life Month. It’s a good time to remember the preciousness of all human life, beginning in the womb and continuing through natural death. There are really two tragedies in every abortion: the killing of an unborn child; and the killing of an opportunity to love. God made us to be better than that. How will we write the law to prevent women from having abortions? 1. The intentional taking of the life of an unborn human being shall be reckoned as the crime of capital murder. 3. The procurement or attempt to procure the murder of her unborn child by the child’s mother shall be evidence prima facie of insanity, indicating a medical and therapeutic response rather than a legal charge. Church teaching is that life–all life–has dignity. Picking and choosing undermines Church teaching itself. That is an interesting personal opinion. In fact, however, the Church distinguishes between innocent and culpable human life. Are somehow abortion and euthanasia taking the lives of people who are “more innocent” that someone suffering from war or poverty? 2. The blood of those who suffer as a result of war is on the hands of the aggressor which began the war. You can twust and turn the logic as you wish, but the fact remains that the the deliberate and premeditiated murder of babies and the aged is intrinsically morally disordered and objectively sinful. There is a third “tragedy” in abortion…the lost love that that child could have poured out in the world, through the grace of God. Thank you Archbishop Chaput for reminding us of this important Pastoral Letter, Living the Gospel of Life. Our first and most important life issue is the ability to live! Everything else, as stated quite clearly, is important as well and must be attended to by faithful Catholics, but if you are dead, those points are moot. “Youth unemployment and lonely elderly” are clearly not the most important issues facing Catholics today. It is a relief to know truth is still being spoken in the public square. Thank you for your courage and faithfulness. You are in my prayers. 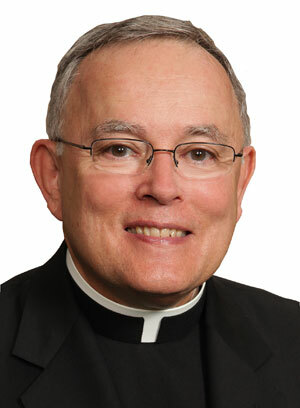 Thank you, Archbishop Chaput, for this excellent commentary. In the Arlington, VA Diocese, the largest abortuary (Fairfax, VA) was closed this year, in large part, due to the faithful pro-lifers and the bishop’s witness. I was there when Bishop Loverde came to lead the rosary and speak to the peaceful protestors. It was a beautiful witness of leadership and holiness in action. His example gave the prayer warriors the strength and grace to pray there daily until the clinic closed. Thanks be to God! May more bishops, cardinals, and popes do likewise: pray publically at abortion mills in defense of the sanctity of human life. Dr. Bernhard Nathanson often remarked on how he and his pro-abortion allies would not have gotten away with what they did if priests and bishops would have been more outspoken. Let’s all do our part to take action. Every day we lose more Americans to abortion than were lost to the terrorists on 9/11. In 2012 alone, Americans allowed an equal number of Americans to be legally murdered by abortion as compared to the total number of Americans killed in all of our wars combined (starting with and including the revolutionary war). Since Roe vs Wade, more than 56 million innocent Americans hidden in their mothers’ wombs have been snuffed out. And know this, Jesus has watched each and every one of them! You have to engage in some severely twisted mental gymnastics to think that any other issue or combination of issues can take priority over the elimination of abortion. I pray that Almighty God will remove the goggles from those Catholics that support legalized abortion in anyway, convert their hearts to follow His commandments, and deliver our country from this evil. “Woe to you if you do not succeed in defending life.” Blessed JPII 1993. A bishop who wants Catholics to vote as Catholics, not as devout Democrats–what a relief. In my opinion, “Economic Justice for All” is a real gem, especially because of the interdisciplinary approach. The argument that somehow abortion and euthanasia are more important than other life issues has no logical consistency. Church teaching is that life–all life–has dignity. Picking and choosing undermines Church teaching itself. is a closer articulation of the USCCB’s letter than the last sentence of your note. The emphasis in Chaput’s article may reflect the reality that in some parishes there is active disengagement from life issues for whatever reason. As you so rightly highlight Catholic Social Teaching stems from for the dignity of all life born or not yet born. I see no problem with individuals seeking to make a difference for one group or the other due to limited time,resources or passion. I struggle with parishes picking some issues to the exclusion of others when in fact all are issues of dignity and respect. a parish active in social justice should be attempting to make it self heard on all the issues where the dignity of human life and the human condition arise. @ John – in regards to poverty, you do understand it’s better to be alive and poor than to be dead – dismembered in your mother’s womb? When we talk about life issues, that specifically means threats to a person’s life – not their quality of life (while still important), but a matter of life and death. Why is that so hard to understand? Dear Monsignor Chaput, thank you for continuing to be such a wonderful spokesman for the Culture of Life; I do not live in Philadelphia, but I have always admired your talent and eloquence when Life matters are concerned. Reading your columns on life issues always renews my hope in the Church, since I believe, like Mr. Guidotti (above), that bishops and priests have remained silent too long on life matters. The culture of death is fiercely tapping into every segment of our society here in the US and throughout the world, with the help of powerful organizations, i.e., the United Nations, The Bill and Belinda Gates Foundation, NARAL, to name just a few. I hope and pray that voices like yours, Archbishop Chaput, will be heard all across America before it is too late. May God continue to shower you with His Love. How will we write the law to prevent women from having abortions? We have choice – we always have had choice, and we always will. All we can remove is the option for a safe and legal choice for poor women – because as we know, wealthy women have always been able to find a doctor to help them – and some poor women have always had abortions paid for by wealthy men or their parents who bullied them into killing their babies. I know it sounds naive and kind of stupid, but I continue to believe that love, prayer and Christian hope is the answer – not politics or legislation. Every baby is a precious gift from God, I pray that all men and women will come to believe and act accordingly in God’s time and will. “Living the Gospel of Life” is definitely worth reading, re-reading and sharing with others. It’s as fresh now as it was in 1998. Also just as relevant and urgent. Given the critical importance and current relevance of this 15 year old pastoral letter, one has to wonder why it has remained so hidden? Cafeteria Catholicism is one of the leading causes of the decline of Catholicism in America. In order to counteract this trend and to protect their flocks, one way if for Bishops to become more actively engaged and to forcefully speak out. And what better way than through the pulpits! For too long our pulpits have remained silent and the results speak for themselves. Also while Bishops have a responsibility for teaching doctrine and representing the Church by setting a sanctifying example, they also have a governing responsibility including enforcement and disciplinary responsibilities (when needed). In this latter area many American Bishops (our present Archbishop excluded) have seemed reluctant to take any public action, especially against the high profile Catholics in their jurisdiction who publically proclaim their Catholicism, receive the sacraments, yet in actual practice and open defiance of their Bishop, they go around proclaiming their own brand of (pro abortion) Catholicism. Perhaps it is time more Bishops to step in and begin taking action. We are most grateful to the Archbishop for his bi-weekly column.